Arts Council England & Core Cities to investigate the potential future for culture in cities across the UK. 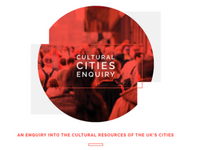 The UK-wide enquiry brings together cities, Arts Councils and leaders from the cultural, education, design, development, hospitality and technology sectors. "Many studies have looked at why culture should be resourced, considering the impact on the lives of individuals and communities. The enquiry will seek to advance the debate by taking a close look at how culture can be more effectively resourced across the UK, to multiply the benefits and ensure they can be shared by all in our society." "Culture is about people and the places they inhabit"
The enquiry is calling for evidence from local authorities and arts and cultural organisations, to help their investigations. You can submit evidence to the inquiry on the Core Cities website. Join the conversation on twitter using #culturalcities.